Layering is often key for soft, touchable skin. Start in the shower or bath with the Moisturizing Body Wash, then apply Body Oil after lightly patting skin dry. Finish by applying lotion all over body. For rougher areas like elbows, feet and knees, apply a final layer of the concentrated cream. Or for overnight treatments apply the original jar formula. Cocoa Butter, enriched with Vitamin E, in a soothing emollient base. Helps smooth and blend unattractive marks and scars. Tones skin. An excellent all-over-the-body moisturiser and after tanning butter. Use immediately following exposure to the sun and wind to soothe dry skin. Ideal for deep moisturisation, including overnight treatments. Widely recommended for stretch marks, during and after pregnancy. Use daily for a soft, youthful appearance. 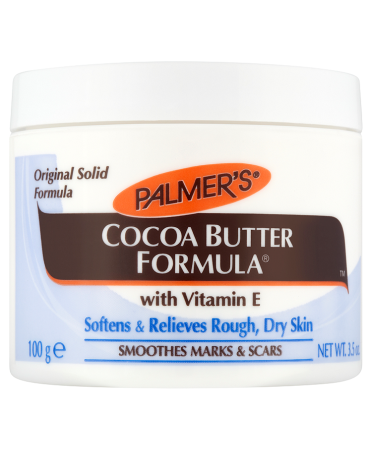 Cocoa Butter is a natural extract from the cocoa bean. It has been used for hundreds of years to soften skin and smooth away marks and blemishes. It also remains the #1 choice to fight stretch marks during pregnancy, weight loss or body building. Vitamin is essential for healthy skin. It is a natural anti-oxidant that works with the body's own cells to protect from free radicals, while providing superior softening benefits.